The news that Donald Trump is not running for President was not welcome at the White House. "The President was really looking forward to running against Trump," a White House insider said, on condition of anonymity. "Now that the Donald is not tossing his hat in the ring, he's thinking about not running himself, just letting Hillary and Joe Biden play rock, paper, scissors for the Democratic nod." When questioned about Obama's change of heart, the source said, "Well, maybe he'll get over it, but right now it doesn't look good. He's curled up in a fetal position, muttering "I'm fired. I'm fired," over and over again. And he was in such a great mood after the he got bin Laden. We hate seeing him like this." It was pointed out that the Republicans have plenty of ridiculous candidates left. Couldn't the President console himself with the thought that one of them has to get the Republican nomination? "Sure, anybody named Palin would be great. Right now he's worried more about Bristol than Sarah. Mike Huckabee dropped out, too, not that the President cares. Sure, he's got a funny name, and so do Tim Pawlenty and Newt Gingrich, but that's no barrier to getting elected, as Barack Hussein Obama knows perfectly well. "Trump would have been ideal. We already had the entire campaign strategy mapped out with fun in mind. 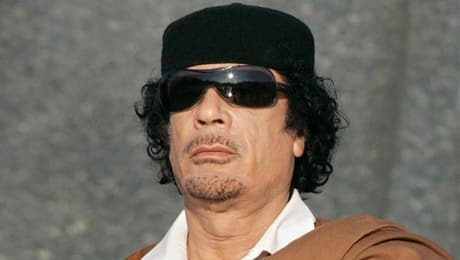 Michelle was going to get her hair dyed blonde and style it in a parody floof of Trump's hair and the President was going to accept the nomination wearing a Gadhafi-style pillbox hat. He really wanted to—he thinks they look swank. We figured he could beat the Donald by ten points anyway. Now he has to fix the economy. He's in an awful mood." What about lesser known candidates? Couldn't one of them turn out to be as politically inept as Trump? "Well, Ron Paul is in favor of legalizing heroin, but unless he's actually exposed as the similarly named black transvestite RuPaul in disguise, he still looks tougher than Trump. And the pizza guy scares us the most. Promising to deliver government services in thirty minutes or less, or they're free." Obviously, having the leader of the Free World sunk in a pre-electoral depression is no good for the country. What does Obama's inner circle plan to do? "Right now, we've got nothing. Sure, we hope that Glenn Beck will go to Vermont to get married to Rush Limbaugh, and then run for President with Limbaugh as his combination Vice President and First Lady, but as far as we know, they're not even dating. If that doesn't happen, we've got to figure out someplace else to send Seal Team Six." Whose scalp would compare to Osama bin Laden's in terms of re-election mustard? "We're thinking Satan. The CIA's got leads on a couple of his couriers. Their names were on bin Laden's thumb drives."